To celebrate India’s Republic day on the 26th of January, I decided to watch a film by Bollywood’s own symbol of patriotism, Manoj Kumar. 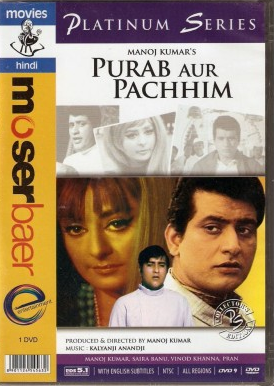 Browsing through his works, I picked Purab aur Pachhim with vague memories of some likeable songs. ‘The East and The West’ says the title, and I knew I was in for some Indo-centric worldview which will appal me in its exaggeration, bias and fabrication. Is this the definition of Patriotism? Not to me. Preparing myself mentally, I readied myself for the film. The tale starts in 1942, in Allahabad. A freedom-fighter falls, betrayed by his a neighbour Harnam (Pran). As he breathes his last, his wife Ganga (Kamini Kaushal) goes into labour and gives birth to a boy, Bharat, who will grow up to be the hero (Manoj Kumar) of our story. Harnam and his wife Kaushalya (Nirupa Roy) break-up over his betrayal and he steals away in the night with their young son Omkar (adult role by Prem Chopra). Kaushalya soon gives birth to a girl, Gopi. The two ladies and the children live with their Harnam’s father (Ashok Kumar). A grown-up Bharat goes to UK to complete his studies and is invited by his father’s friend Sharma (Madan Puri) to live with his family. His family (wife Rita (Shammi), daughter Preeti (Saira Banu) and son Shankar (Rajendranath)) are not Indian in their outlook, though they are decent folk. Bharat’s coming affects them all in different ways. Sharma remembers again his connection with India and wallows in nostalgia. Shankar is attracted to Indian spirituality and starts exploring it. Preeti is bewildered at first but then starts admiring and later loving Bharat. Rita rests bewildered. Coincidentally (well, this IS Bollywood!) the Sharma family is acquainted with Harnam and Omkar. Omkar is obsessed with Preeti and wants her at any cost. Preeti is more interested in Bharat and by the time he finishes his studies, they have an understanding that they will marry. But she wants him to stay back abroad while he wants to go back to India. Bharat agrees that if she dislikes India even after an extended stay, he will return to UK with her. In India, the Sharma family (sans mum) are drawn to the way of life. Drama arrives when Harnam returns and then later Omkar, with evil intentions. After a complicated climax, everything comes to a happy conclusion. An unfaithful and violent husband who abandons a woman is still to be considered God and begged to fulfil his wife’s life ! Non-resident Indian women are chain-smoking, alcohol-swigging ladies with no value systems. By the way, this view has not changed much over the years; I recently saw Cocktail in which Deepika Padukone plays a NRI woman who is shown as a party-girl and Diana Penty is, in contrast, the ‘good’ Indian girl! Non-Indian women are all easy! Indians have a monopoly on culture, wisdom, sobriety etc. ‘Love India’ is a message I can live with but ‘Disrespect all other cultures’ is the subtle-undertone of this message, and that I cannot live with. It is to be noted that while spouting Indian values, the writer-director-producer of the film does not hesitate to use nubile sparsely-clothed young ladies to titillate and sell the film at the box-office. Such hypocrisy! Leaving my (serious) objections aside, the film is well made and watchable. Manoj Kumar’s acting is very low-key which I quite like. Saira Banu is ideally cast for this role and though she does not handle her one emotional scene well, she does a decent enough job for the rest. Supporting cast are all better than the lead actors, especially Pran. Vinod Khanna is totally wasted. The music by Kalyanji-Anandji is melodious, with Mahendra Kapoor as the star performer – and he does very well indeed! I found that his voice suits Manoj Kumar very well. The lyrics are mainly by Indeevar with a song contribution each by Santosh Anand and Prem Dhawan. Dulhan Chali – Mahendra Kapoor. Lyrics: Indeevar. Despite the 42 years which have passed by, I reckon this song is still well-recognized in India thanks to its suitability for both baratis and for telly-time on patriotic occasions! A rousing song, well sung. Hai Preet Jahan Ki Reet -Mahendra Kapoor. Lyrics: Indeevar. Though I am not much for over-preachy songs, I was struck by the words. Well done Indeevar! Another patriotic song, with a catchy refrain भारत का रहने वाला हूँ भारत की बात सुनाता हूँ . Shot in a revolving floor of a restaurant, I remember watching the clip as a kid and being quite amazed! Raghupati Raghav – Mahendra Kapoor & Manhar. This traditional and well-loved chant is used in multiple places in the film. Too much drama in some renditions, but Mahendra Kapoor is in good voice. Koi Jab Tumhara-Mukesh. Lyrics: Indeevar. Sad songs somehow sounds sadder in Mukesh’s voice! Well written, well sung song. Purva Suhani Aayi Re – Mahendra Kapoor, Lata Mangeshkar, Manhar. Lyrics: Santosh Anand. The rather sad melody doesn’t match the cheerfulness of the words. Shot like an ad for tourism, it is an entertaining watch. Om Jai Jagdish -Mahendra Kapoor, Shyama Chittar, Brij Bushan. This traditional aarti song always sounds good to me. Twinkle Twinkle – Mahendra Kapoor, Asha Bhonsle. Lyrics: Prem Dhawan. Naaaaah…doesnt work for me, this strange mix of nursery rhymes and bhangra music. To listen to the whole album, click here. For today, I have selected Dulhan Chali as my featur song simply because you can enjoy a glimpse of the Republic Day parade in its picturisation. Enjoy! I picked this film today out of my big stack of yet to see films almost with a sense of duty. You see, my movie watching was censored by my parents in the seventies and violent films like this never made the list. My own leanings also kept me away from this genre. ‘My’ Amitabh Bachchan was the Amitabh of Anand, Abhiman, Silsila, Chupke Chupke and Mili. Realising that I had quite missed the whole ‘Angry Young Man’ phase, I picked up a DVD with three of Amitabh’s action films. Today I come to the first of these, to a film which was a super-hit and propelled Amitabh to the top tier of Bollywood stardom. A little boy watches his parents being murdered, traumatised and scarred for life. Vijay grows up to be police officer, an officer who doesn’t hesitate to go out of established procedures and boundaries to deal with criminals. In short, he has the personality of a vigilante in the garb of a policeman, not a man I could like at all. But I have to say that Amitabh does this ‘brooding, suppressed violence’ personality very well. Sher Khan (Pran), who runs gambling dens, comes to Vijay’s attention and he takes him on. In a very unconvincing episode, Vijay challenges Sher Khan to a fist fight, after which Sher Khan magically reforms! He also gives his hand in friendship to Vijay. Pran as the Pathan is very well cast and does an impressive job as Sher Khan. Mala (Jaya Bhaduri) is a knife sharpener+ street performer who also comes in contact with Vijay. The gentrified Mala from the later part of the film is more suited to Jaya rather than the loud and rough-edged Mala at the start. The Big Bad Man in his locality, Teja, who coincidentally happens to be the man who killed his parents, is the next one Vijay unknowingly takes on. In one of the episodes, Mala comes to risk and Vijay invites her to stay with his brother and sis-in-law for safety. They develop a rapport and an understanding. Again, I find this relationship unconvincing. How did they breach the divide of the classes so easily? How did a rough, uneducated woman become so easily gentrified? Its telling that the sis-in-law calls Mala’s clothes as ‘fancy dress’ when she first meets her. The chasm between the educated middle-class and the uneducated low-income workers is real; intimate relationships cannot be built that easily. Teja manoeuvres Vijay into being convicted of taking bribery and he is jailed for six months. When he comes out of jail, he is an embittered man. Mala convinces him to give up revenge, which he tries but Teja still comes after him. With Mala’s permission Vijay returns to the fray and the ending is satisfyingly predictable. The film is well-paced with good performances not only by the leads but also by the supporting cast. The script, with coincidences galore, stretches one’s credulity but no more than other Bollywood films of that era. I dislike revenge as a theme; I consider it to be one of the baser instincts of mankind, why celebrate it? I neither admired nor respected the protagonist, so I could not quite like the film. But I am in the minority evidently, this film enjoyed a huge success. Coming to the music by Kalyanji-Anandji, I can only call it average+. The lyrics are by Gulshan Bawra; there is some decent poetry in places. Chakku Chhuriyan – Asha Bhonsle. A pedestrian song. Asha’s high pitched vocals do not suit Jaya at all. Dil Jalon Ka – Asha Bhonsle. This is a club number with Bindu shimmying and wriggling to this song. I like this better than the previous Asha solo, still it is not something I am going to pick out to listen. Diwane Hain Diwanon Ko – Mohammad Rafi, Lata Mangeshkar. A nice song with good harmonium interludes. Bana Ke Kyon Bigade Re – Lata Mangeshkar. Well written lyrics and a beautiful melody, sung well by Lata. The music director has delivered the spirit of the words. It is an excellent composition with a lovely melody and interesting changes in tempo. Add to it Manna’s impeccable singing, Pran’s naturalness, Amitabh’s brooding intensity ..and you have a truly memorable song. My choice for today must be evident by now, enjoy!! 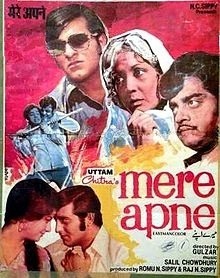 Talking to a friend about the films from the seventies which made an impression on me, I remembered Mere Apne and went searching for it on Youtube. Glad to find it, I sat down expecting a treat. I still loved the songs but the movie…hmmm….. The film opens with an old lady, Anandi (Meena Kumari), who lives alone in a village. We see her being visited by a slimy man (Ramesh Deo) who claims to be a distant relative. He invites her to come and live with his wife and him in the city. Of course our antennas are up, expecting disaster, but Anandi quite innocently accepts his invitation. The director succeeds quite consciously or unconsciously to show us how very cynical we are, how our innocence has been lost. Anandi is bewildered by the ways of the city. She realises only after being clued in by a servant that she has been brought by the couple to act as an unpaid nanny for their child. दूसरे को अपना कहे जब अपना काम पड़े she says to herself, understanding finally the ways of the world that she has come to. It is a dark world of disillusionment and the disillusioned, of joblessness and violence, of hunger and selfishness that the movie makers want to show us. She acts as our eyes as we are introduced to a world where family values have disappeared and selfishness rules, where the young are lost with none to guide them, where unethical politicians use strong arm tactics and violence rules the streets. When she gets thrown out of her so called relative’s home, it is Shyam (Vinod Khanna), the leader of one gang, who takes care of her. She in her turn showers affection on the gang members and is slowly making progress in weaning them out of their destructive lives. But will she be able to turn them around? Or will she be destroyed herself? You’ll have to see the film to find out! When I saw this movie in the eighties, it was already a decade old. It made an impact on me then. Now, in my advanced years, it seems to be too contrived. It is the script which I object to (sorry Gulzar, I do admire you normally!) The cast does a reasonably good job. Meena Kumari is competent if uninspired as the story teller. Vinod Khanna looks young and dashingly handsome and if he looks wooden at times, one is (well, I am) inclined to ignore it! Shatrughan Sinha is a strong and fascinating presence. Asrani, Danny Denzongpa, Paintal and Dinesh Thakur all have roles as gang members and make an impact in their own way. You’ll find many other well-recognizable faces in this cast rich film. Yet no one person stands out. Is that good or is that bad? The music by Salil Chowdhury is beautiful and Gulzar has written some memorable words. There are only three songs, all three very pleasing. Haal Chaal Thik Thak Hai – Kishore Kumar, Mukesh. This sarcastic and political song is very well crafted and sung. Interludes on the mouth organ and the whistling add a nice touch. Kishore does his trademark yodelling making me nostalgic for that era of music! Koi Hota Jisko Apna – Kishore Kumar. One of my all time favourites. Gulzar’s words touch the heart, see how well they are scripted! Salil Chowdhury’s music adds a melting pathos to the words but it is Kishore Kumar who raises the song from good to great. Superb. Roz Akeli Aayee – Lata Mangeshkar . This is somewhat of a hidden gem ; though I remembered the other two songs distinctly, I had forgotten about this one. A gentle and beautiful melody. To hear the whole album, click here. My today’s choice was a forgone conclusion, even before I sat down to see the film. Here is Kishore’s Koi Hota. Enjoy! The title ‘Nest’ is an excellent one for the film, one of the few I have seen on the subject of lack of housing in Mumbai. An interesting and well made film with a good cast and excellent music, it has been largely ignored by Bollywood bloggers. The only review I read was scathing which surprised me as I found the film to be a good watch. A young woman Chaaya (Zarina Wahab) joins a small business as a typist. She had been interviewed and selected by the well-to-do, middle-aged owner Mr. Modi (Shreeram Lagoo). A widower, he is introduced to us as recovering from a heart problem. At work, a rather chaloo young man, Sudeep (Amol Palekar), stars a flirtation and soon the two start spending a lot of free time together. One would think that they are in love. Puzzlingly the song Tumhe ho na ho, which shows the mental status of the young woman, tells us that much as she enjoys his company, she is certain that she is not in love with him. It is puzzling because we see that they seem to be much engrossed in each other and soon decide to marry. The one big hurdle is the lack of housing in Mumbai and when they put a deposit for a flat in a new construction site, they are both very happy. In the meanwhile, Chaaya is uncomfortably aware of the interest shown towards her by Mr.Modi. She learns early on that she was hired for her resemblance to the late Mrs.Modi. Even though there is no overtly inappropriate advances by Mr.Modi, he shows her favouritism and her guard is up. There is soon a confrontation with her saying ‘आपके मन में पाप है ‘ (you have sin in your mind) while he responds gravely saying ‘तुम मुझे अच्छी लगती हो’ (I like you) and that he would like to marry her. The construction the young couple have invested in turns out to be fraudulent and it leaves them both in shock. ‘I cannot fight this battle where one is lost before one starts’ says Sudeep. ‘It looks as if one can climb here (in this city) only by putting one’s feet on someone else’s head’. In this important scene of the film, we come to know the mind-sets of the two protagonists, which is critical in understanding their actions to come. Sudeep wants Chaaya to accept Mr.Modi’s proposal as he is unwell and would not live long. After he dies, his wealth would be theirs. Her first response is ‘छी! किसी की कब्र पे मेरा घर बनाऊँगी ?’ ‘Shall I make my house on someone’s tombstone?”. I enjoyed Gulzar’s unmistakable hand in the dialogues, like for example इस शहर के लोग रोने के लिए नहीं कंदा देते, मरने तक इंतज़ार करते हैं कंदा देने के लिए . But the seed planted takes root. Chaaya is disillusioned with Sudeep. She also wants to help her brother with his higher education and agrees to marry Mr.Modi with a mercenary intention. She tries to fit into her new life but is conflicted in many ways. But she finally manages to reconcile her conflicts and accepts her husband whole heartedly. He also thrives in this marriage and his health improves. But Sudeep doesn’t fare well. He can’t accept the loss of his girl. Perhaps he never meant her to follow the suggestion he thought of in despair? He is also hunted by the loan-sharks from whom he had borrowed for the disaster of a flat purchase. How will it all resolve itself? Will it resolve itself? The ending seemed a bit hurriedly put together and I didn’t find it well convincingly scripted but then I’ll let you see it and decide for yourself. Shreeram Lagoo carries the film ably with Amol Palekar and Zarina Wahab doing good jobs in their roles. Jalal Agha has given an excellent performance in a supporting role, as also Sudha Mehra whom I have always admired for her acting skills. The music is excellent but I give first credit to Gulzar and Naqsh Lyallpuri’s beautiful poetry which Jaidev has moulded expertly into music. Tumhe ho na ho – Runa Laila. Excellent lyrics and charmingly sung by Runa Laila. After seeing it, I wanted to eat chaat in Chaupati too! Jaidev has made his music match Naqsh Lyallpuri’s poetry perfectly. I had mistakenly thought this to be Gulzar’s work but thanks to a reader, I stand corrected. Do diwane sheher mein – Bhupinder and Runa Laila. Well written by Gulzar, beautifully sung and charmingly filmed, it shows how songs can be incorporated convincingly even in a non-masala film. When the hero and heroine caper, they give in now and then to giggles at themselves and are very aware of making a spectacle of themselves! To listen to the full album, click here. As there are basically only two songs, and both very good, I am going to embed both for you. Enjoy! Since Rajesh Khanna passed away last month, I have wanted to review one of his films but have been deliberately procrastinating. I think perhaps I am having trouble coming to terms with his death. He represents an era in the Hindi film world which is personally meaningful to me. Through his films I passed from childhood to my early teenage years, learnt to appreciate filmi music and became more aware of the world in general. A coming of age as it were. With his passing away a bit of my world has passed away too. The sand castle of my life has already been assaulted as the tides have started coming in; this is one more step towards its destruction. So when my husband picked up Sachaa Jhootha as our late night watch yesterday, I did have a few moments of reluctance. Surprisingly, I have never seen this film before! On the whole it was not a bad film; the first half was well-scripted and brisk but the director somewhat lost control of the plot in the second half. Bhola (Rajesh Khanna) is a dirt-poor young man from a village. He lives with his disabled sister under the cruel treatment of his step-mother. Uneducated but with some musical skills, he decides to go to the city to earn a living. Good hearted but extremely naive, I could not find this character as appealing as the film makers wanted it to be. Ranjit (also Rajesh Khanna) is a rich diamond merchant by day and a jewel-thief by night, a leader of his own gang. He is clever and cunning but ruthless, not stopping at even murder. Thankfully there is no background story to wring sympathy for him. Bhola and Ranjit look, as you can well guess, exactly alike. And no, they are not long lost twins, thank God! When Bhola comes into town, he gets mistaken for Ranjit at a costume party. Ranjit, who is in disguise, sees this and immediately thinks of all the opportunities this presents. He cons Bhola into training to be his double. His in-house moll Ruby (a meaty role for Faryal) is Bhola’s trainer. The police have suspicions that Ranjit is the jewel thief but have no proof; they make elaborate plans to trap him. The plot is devised by Inspector Pradhan (a very dashing young Vinod Khanna). Another officer, Rita (a gorgeous Mumtaz), is to act as the lure to catch Ranjit who has an eye for a pretty lady. What follows is typical Bollywood fare of the 70’s. There are uses of unspecified chemicals by the thieves – a truth serum and some kind of stunning mixture. There are police bugs and inefficient snipers. There is a clunky recording device. There is a sword fight. And best of all, there is a really clever dog chasing a car, two cars chasing the same dog, and the dog finding its way to the court to identify the bad man in the climax!! Rajesh Khanna is adequate as Bhola but quite good as Ranjit. His representation of innocence and naiveté borders on imbecilic which I quite object to. His dancing has always been abysmal and surely he could have done better with his wardrobe choice? Red trousers with a bright red shirt, a bottle-green suit..honestly!! However he does know how to deliver dialogue and has his signature charm. And as Ranjit, he does ‘cold-hearted’ very well. This role won him a Filmfare award. Mumtaz is not at all convincing as a police officer. But in her role within her role to attract Ranjit she just has to look pretty and she does that and how! This film was one of her stepping stones from being a supporting actress to a lead one, and she looks tentative at all times. Vinod Khanna too seems somewhat amateurish at times but so very handsome that I didn’t much care! Again, this was before he started playing lead parts and his skills are obviously raw. The supporting cast members do reasonably well. The music by Kalyanji-Anandji is not of uniform quality. There are two good songs but the others left me cold. The lyrics are by Indivar, Gulshan Bawra, and Qamar Jalabadi. Meri Pyari Behaniya – Kishore Kumar. The song which was to be played in thousands of baraats (marriage processions) in the future has a slightly melancholic air. Normally the baraat songs are cheerful and the bidai songs are sad, but this is a strange mixture of two emotions! Well tuned and well sung, I am unable to judge its true merit as it is overly familiar! Dil Ko Dekho Chehra Na Dekho – Kishore Kumar. Rajesh cannot dance but Kishore can certainly sing! The melody is not too bad but somehow doesn’t quite hit the mark. Duniya Mein Pyar Ki – Asha Bhonsle. A totally pedestrian tune warmed up slightly by Mumu’s wriggles. I am sorry to say that even her dancing at places is stiff and unconvincing. Don’t bother listening. Yunhi Tum Mujhse Baat – Mohammad Rafi & Lata Mangeshkar. This superb gem is a surprise in the otherwise middling album. Kishore Kumar was in his ascendency at this time yet it is Rafi who strikes a chord with this song. Melodious and beautifully sung. O Kehdo Kehdo – Kishore Kumar & Lata Mangeshkar. Another rather pedestrian song, I can’t recall this song ever playing in the radio. Did it? But this is at least well sung. My song choice for the day is evident I guess. Enjoy !! Seeing my ironing pile increase to an Everest-like magnificence, I decided to get down to some movie-watching. What’s the connection you ask? Well, I can’t iron without entertainment! I checked my list of to-see films and chose Kati Patang. Though I know the music intimately, I have never seen this film before. A young-woman, Madhu (Asha Parekh), runs away to her beloved on the day of her arranged marriage to a man unseen (which era is this?!!). Her beloved does not deserve the title, for he is a cad, only after her money. She is shocked (but why? this is Prem Chopra, what can she expect?) only to find her uncle and guardian is dead. She leaves then (no funeral? ), running to nowhere, when she meets a widowed friend travelling with her small child to meet her in-laws for the first time. The train crashes and her friend dies, demanding a death-bed promise that Madhu pretend to be her (but why?) and go to her in-laws with her baby. The taxi she catches turns out to have a dastardly driver and she is rescued by Kamal (Rajesh Khanna) who happens to be the groom she has run away from! Do the coincidences befuddle your brain as much as they do mine? Kamal and Madhu fall in love, but she is a pretending to be a widow and re-marriage is not easily accepted in society. Kailash the Cad (Prem Chopra) is alerted by his girl-friend Shabnam (Bindu) and comes to blackmail Madhu. She tries to resist but it is not easy. In the meanwhile, Madhu writes to Kamal confessing her story but the letter falls in the hands of her father-in-law Dinanath (Nasir Hussain). He is angry at first but then he accepts her and even talks to Kamal’s father, arranging Madhu’s marriage with Kamal. Tragedy strikes when Kailash the Cad poisons Dinanath the FIL and Madhu is taken into custody by the police. Will her innocence be proven? Do Kamal and Madhu have a future together? Well, you’ll have to watch the film to find out! I do hate it when script-writers pretend to give a social message but are in fact manipulating the audience. Is this film meant to encourage widow re-marriage in traditional families? But then Madhu is not really a widow, is she? Blast, I am not supposed to see through their ruse, am I? There were other instances of audience manipulation which I found distasteful but I admit, I am just being picky. This is Bollywood, its par for the course. 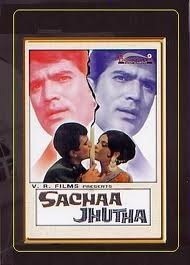 Rajesh Khanna proves why he was such a success. He has this certain intensity….hmmm, I am a woman after all, you must forgive me if I fall for a man’s charm now and then! Asha is not my favourite but she does a reasonable job. Prem Chopra is as slimy as a badly cooked okra and Bindu is Ooooomph incorporated, especially in her next-to-nothing costume for her dance sequence. I imagine she caused a sensation in those more innocent times! Overall, the film is watchable especially given the lovely songs. The music by R.D.Burman is the highlight of this film and Anand Bakshi has done a superb job of the lyrics. Yeh Jo Mohabbat Hai – Kishore Kumar. Charming. Truly. Is there anyone who can emote so beautifully with their voice like Kishore? Is there anyone who can emote to Kishore’s voice like Rajesh? A masterclass in Bollywood singing-lip synching. Pyar Diwana Hota Hai – Kishore Kumar. Its impressive how Kishore never over-does things, however capable he is. This is a simple melody and he has sung it simply without any flourishes. I like the simplicity of the lyrics too – सुनो किसी शायर ने यह कहा बहुत खूब, मना करे दुनिया लेकिन मेरे महबूब (Some poet has wisely said, the world may deny it, but my beloved is still my beloved). Well said! Mera Naam Hai Shabnam – Asha Bhonsle. Hmmm. Not much to my taste but Bindu looks sensational! Jis Gali Mein – Mukesh. I love this song! I know there are many Mukesh detractors out there, but when he does a superb job, what’s there to say but वाह वाह ? Anand Bakshi has outdone himself with the romance of his lyrics. Yeh Shaam Mastani – Kishore Kumar. A cheerful number with Kishore showing his yodelling skills. And his masterful rendition of ऐसा लगे जैसे की तू हसके ज़हर कोई पिये जाय ! Oh! Aaj Na Chodenge – Kishore Kumar, Lata Mangeskhar. A popular enough Holi song, sung with enthusiasm by Kishore. See how different his voice sounds compared to Yeh Sham Mastani – he brings a roughness, an earthiness into his singing. Clever. And R.D has created an equally clever mix between the exuberance of Kishore’s singing and the sadness of Lata’s verses. My choice for today is Mukesh’s song. This in no way denies my worship of Kishore’s voice! I was eager to watch this film for some time now. It had been described to me as a ‘great film’ by more than one person and it starred two handsome gentlemen I admired much as a young woman. The few songs I remembered from my childhood triggered a nice response too. The two handsome men did not disappoint; I am in awe of their looks and presence. And the acting is not too bad either! The songs I remembered were pleasing enough though not outstanding. However, perhaps thanks to over-expectation, I was mildly disappointed in the film as a whole. This is a theme which has been done more number of times than I can count. A village cowed by evil-doers, one or a few handful of men protecting and leading the village to self-sufficiency. Wasn’t the Seven Samurai just fantastic? 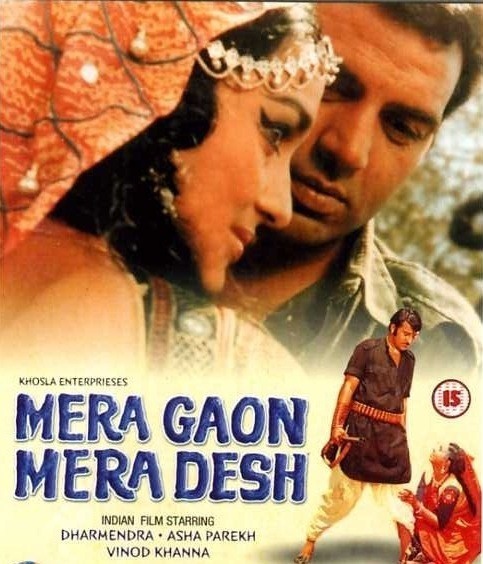 For Bollywood fans, this film is particularly interesting because it was a precursor to the super-hit Sholay. In fact, I was shocked to see how much Salim-Javed have ‘lifted’ from the screenplay by G.R.Kamath. Jabbar stands his people in a row, questioning them, while loading one bullet in his gun. Gabbar does this and more in the memorable ‘Kitne Aadmi The’ scene. Ajit (Dharm) is a petty crook invited by Major Jaswant Singh (Jayant) to help him farm and at the same time make a new life for himself. He doesn’t mention the dacoits who keep the village under their thumb. Ajit settles down after a few slips and enjoys a nice romance with village belle Anju (Asha). The dacoits under their leader Thakur Jabbar Singh (Vinod Khanna) make their presence felt. In this village where everyone is cowed and fearful, only Ajit is willing to stand up to them. Munnibhai (Laxmi Chhaya) is the dancing girl who is a spy for the dacoits but she falls for Ajit and becomes a double-agent. With the odds stacked so heavily against him, will Ajit manage to rid the village of their terror? Dharmendra has done a decent job of his role; in any case, I was too charmed to be unbiased! Vinod Khanna is excellent, menacing with his red rimmed eyes which always stare elsewhere with manic intensity. What a handsome man he is to be sure!! Asha Parekh’s role doesn’t have much meat and she is not in good looks; her costumes are very very unflattering. I wish they had chosen another female lead. Laxmi Chhaya is competent and has two lovely song-and-dance sequences to impress us with. Supporting actors such as Jayant and Asit Sen are dependably good. So why was I disappointed? It always comes down to bad screenplay. I cannot deal with with melodrama (a drunk Dharm sleeping it off in the lap of a mad Ma, a dying Jayant asking to be called Papa), depiction of the police as nincompoops, Dharm beating up Laxmi Chhaya, Asha walking into a dacoit-infested forest on her own (is she mad?!!) – the screenplay just annoys. And the moralistic lectures at the end grate. There is some decent enough music by Laxmikant-Pyarelal with pedestrian lyrics by Anand Bakshi (spelt mysteriously as Baxi in the titles). Sona Lai Ja Re – Lata Mangeshkar. A pleasant enough melody, but nothing extraordinary. Aya Aya – Lata Mangeshkar. Boring. Laxmi Chhaya dances well enough on screen. Kuch Kehta Hai Ye Sawan – Lata Mangeshkar, Mohammad Rafi. I remember this song well from my childhood; it still sounds as pleasing as it did then. Lyrics are so-so but Rafi and Lata sound very good. Hai Sharmaoon – Lata Mangeshkar. Laxmi Chhaya gets to dance to this nice song made more memorable by the on-screen drama. The melody has a hint of sadness which I like. Maar Diya Jai – Lata Mangeshkar. Why not Asha? I think she would have put even more verve into this song. Still, I remember and like it. My selection today is Hai Sharmaoon, for Laxmi Chhaya’s dance and upper-lip adornment by the handsome male leads. Check out Vinod’s luxurious greying mouche and a more sedate one sported by Dharm! The views expressed in this site are my own and should not be duplicated without my permission. I reference information freely available in the public domain. If available, I provide links to music already available online. When I do load music, they are only what is already available online on well-known sites such as MusicIndiaOnline. I load them merely to facilitate access; they are not downloadable. I have no commercial interests or monetary benefit. I provide music for educational purposes (Carnatic Music appreciation), for criticism and for comment. Contact me if you feel that I have infringed on your copyright and I will remove what you object to. Music To My Ears · ..about listening to sounds and silences..